By the 15th and 16th century, the Catholic Church, by now closely aligned with the state, was largely corrupt. The offices of bishop and pope were traded and purchased for favours or gold. Many of the popes, bishops, and priests of the time lived immorally and much of the activity of the Church ran counter to scripture. More and more men became disillusioned with the Church, especially after Johann Gutenberg’s printing press enabled the spread of different ideas and interpretation of scriptures; these writings were often in in contrast to the official Church teachings. A German monk by the name of Martin Luther also didn’t agree with all of the Catholic Church’s doctrine. The Catholic Church taught that man is saved by works and not by faith. Luther, who was a theology professor, began to understand through his lectures that one is not saved due to works, but through the grace of God. Of course, this doctrine ran counter to Catholic Church teachings. The Pope warned Luther with an edict that he risked excommunication unless he recanted. He didn’t recant and as a result, Luther was asked to appear before the imperial diet in 1521 which was presided by Charles V. In April 1521, Luther appeared before the Diet of Worms. This was a general assembly of the estates of the Holy Roman Empire that took place in Worms, today in Germany. Prince Frederick promised a safe conduct for Luther to and from the meeting. Johann Eck, who represented the Catholic Church, presented Luther with copies of his writings laid out on a table and asked him if the books were his, and whether he stood by their contents. Luther confirmed he was their author, but requested time to think about the answer to the second question. The next day he answered that unless he was convinced by the testimony of the Scriptures he could not and would not recant anything, since it is neither safe nor right to go against conscience. The Church pressured Luther to take back or recant all he had written. Luther refused and was consequently condemned as a heretic.This condemnation meant that anybody was free to kill him without penalty. However some of Luther’s powerful friends kidnapped him and hid him in a castle at Wartburg where he translated the Bible into German. 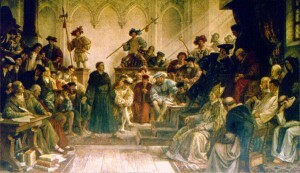 During this same time, other men such as John Calvin in Geneva and Ulrich Zwingli in Zurich spoke up against the Catholic Church and people protesting against the established Church were called Protestants. 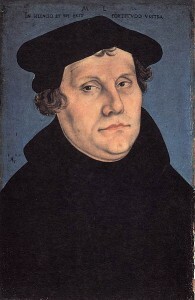 Martin Luther is the ultimate founder of the Lutheran Church, which stemmed from the Protestant movement.